Soon after the Presidential Election Mr. Ranil Wickremesinghe threw his first hat into the ring. On Monday March 17th he used the second to speak through. No doubt if elected Prime Minister, he will use his third. Besieged by growing demands for accountability in the Bond trading fiasco Prime Minister Ranil Wiskremesinghe decided that attack was the best form of defense. Sadly his use of bombastic banalities as cluster bombs has not helped him to diffuse the crisis. The charge of ‘Ugly’ governance persists. His parliamentary performance was intentionally made in English. A few concise amplifications made in Sinhala with colloquial appellations were meant to earn the headlines in the Sinhala press. සදාචාරය ගැන පාඩම් කියල දෙන්න එනවා. පැමිණ අප සමග මුහුණටමුහුණ සටනකට එන ලෙස මම ඔවුන්ට අභියෝගකරනවා . Given the furor of the storm he managed a long rambling delivery with hardly an interruption. In our parliament speaking in English is as safe and as effective as the American drone attacks over the Khyber. Hardly effective and definitely counterproductive. It also makes the fundamental error that ‘Gamaralas’ have no idea of bond trading while it may be home turf in fifth avenue Colombo and Manipay Jaffna. In the style of a meandering Moses quite undecided when and where to part the sea he began with the tiring terminology of the Rajapaksa Regime. 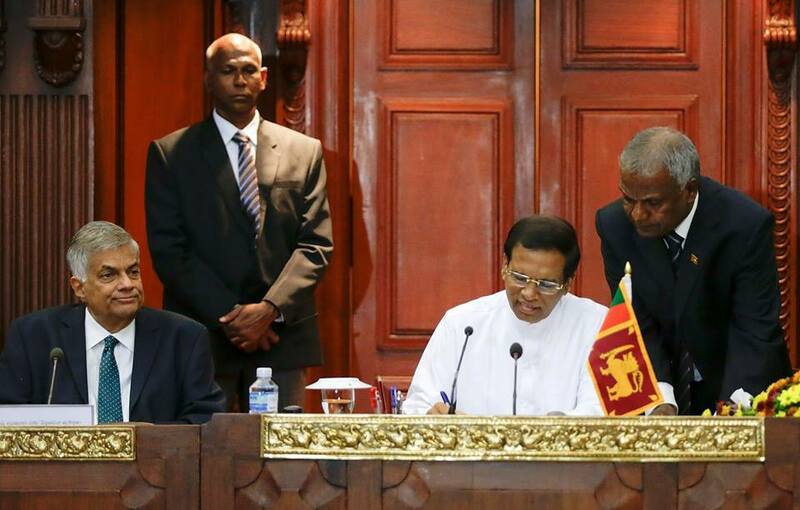 The Ministry of Highways of the Rajapaksa administration had made commitments and signed contracts totaling over Rs 100 Billion, without any monetary allocation. Funds were needed urgently to meet these payments. It was decided that Rs. 15 Billion would be required urgently. It was then decided to raise a part of these monies through an auction of Treasury Bonds. By then, the Central Bank had already advertised the issue of Rs. 1 Billion Treasury Bonds. He was fortunate. None in the opposition dared to ask ‘Hey, if Parliament has full control over finance, why didn’t you ask us before advertising the issue of Treasury bonds? Mr. Wickremesinghe knew his audience. Hands clasped behind his back, he bent over and surveyed the house 360 degrees. In the style of Mister Micawber he asked “Do you know about bond trading? Does anyone here know about Bonds? The sullen silence that our Mr.Micawber was more than macabre. The Bull Elephant went on the rampage. He made a specific reference to two heads of private banks and asked how they received the patronage of political personalities. Ranil Wickremesinghe the crusader for good governance asked a no holds barred question. How can Mr. so & so head a Bank given the large number of surveillance referrals made to the Colombo Stock Exchange? Now that was taking the Bull by its nose string. It demonstrated the zeal of the Prime Minister in cleansing the corporates. Yet doubts linger. Mr. Dinesh Weerakkody his newest advisor, son in law of Mr. John Ameratunga was elected Chairman of the Commercial Bank some time ago. It was well known at the time that it was with the active support of Defense Secretary Gotabaya Rajapaksa whose loyal aide Lakshman Hulugalle was then an influential member of the board of the Commercial Bank. Mr.Dinesh Weerakkody is now a director of the Access Group which was and still is a major player in the Road Development projects of the Rajapaksa regime. Bad as they are, they need to be continued. The criticisms leveled were ill-informed and malicious in intent. Justifying the nomination of three Perry Masons or Kavanagh QCs to probe and report he elaborated on their credentials. Questioning the competence of the tribunal he said was a deliberate campaign of vilifying the government he asserted and indulged in his own vilification of his detractors and named them with no interruption from the chair. Being Prime Minister has its privileges. Anybody who has reservations about the panel could seek further details from the Bar Council. He explained why the probe had to be made by lawyers and only lawyers. Who else could determine whether the bond in question was a transgression of the law? With that brilliant argument that would disarm a Disraeli he confined the ‘Affair Arjuns’ to a matter of legality and not of propriety. The three members of the Panel were respected members of society. They were knights of Siri Kotha. Then emerged the epochal man. Ranil in the role of Robespierre! The ‘Affair Arjun’ inflamed the gospeller in him. “Take the case of John Keells” he pointed. “The Government’s decision to cancel the casino licenses has resulted in shareholders dumping their shares. This is the only way to show their protest against questionable choices by the management” he intoned in the manner of an ascetic Calvinist. It seemed that Götterdämmerung – the twilight of the gods was at hand for some conglomerates. The irony lies elsewhere. Citizen Kane – the film is now owned by Ted Turner the pioneer of 24 hour TV news. The Prime Minsters performance in the house is sure to be remembered. “Politicians are like warts on the body of society.” The only thing worse than warts are lawyers!